As you know, last night was the first round of the NFL Draft. Since I’m well known as a Super-Duper Draft Expert (seriously, it's on my business card) I thought I'd share with you my grades for the first round of this year's draft. I give you my report card for the first round of the 2010 NFL Draft. To the NFL for encouraging a bunch of egotistical spoiled brats by giving them millions of dollars and a sense of entitlement. To Tim Tebow for bringing a little God to the draft. We don’t hear enough about God in America right now. 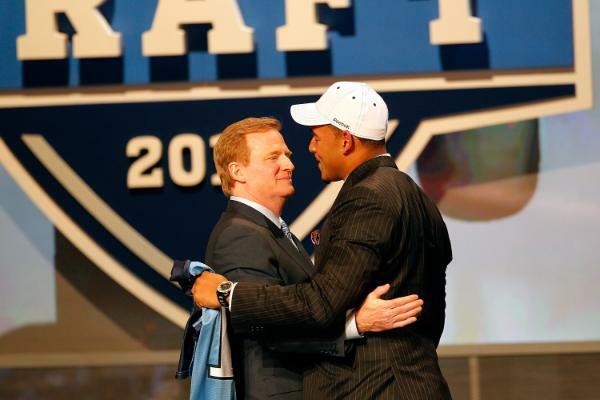 To Roger Goodell for correctly pronouncing Ndamukong Suh — this years #2 draft pick. To the official NFL Draft hat. It’s the first hat in several years that doesn’t make the players look like clowns. To Roger Goodell and Derrick Morgan for sharing their love with the world. To the NFL for handing out jerseys with the number 1 on them to every player even though we all know they’ll never wear that number. To the term “character issues” because it means nothing if the guy is a superstar. To the ridiculous number of pinstriped suits. You’re football players, not mob bosses. To Ndamukong Suh’s parents for not making it more clear that their son is a house of spears. To Chris Berman for not sweating more. To the NFL for scheduling this on a Thursday night during two new hilarious episodes of 30 Rock requiring me to do actual research since I didn’t watch a second of the draft.